Blooming hedgehog cactus at Ironwood Forest National Monument. Photo BLM. The Ironwood Forest National Monument (IFNM) comprises 129,000 acres of prime Sonoran Desert northwest of the Tucson basin. There are eight mountain ranges and two large valleys with elevations ranging from 1550 to 4195 ft. The mountains have complex and variable geological histories, some being entirely volcanic in origin and others having significant intrusions of limestone and other rocks. This variability impacts the kinds of plants and animals that live here. About 45% of IFNM is classified as the Arizona Upland subdivision of the Sonoran Desert and the remainder is considered the Lower Colorado River Valley subdivision. Nearly 600 plant species and 121 vertebrate animal species are found within IFNM. The area is maintained by the Bureau of Land Management (BLM). No permits are required to visit the area, but you should consult the BLM leaflet that describes access and gives a map of the monument. There are no facilities so precautions should be taken to avoid excessive heat and lack of water. Temperatures range from below freezing in the winter and up to 110 F in summer. Rain averages about 10 inches per year with a winter rainy season and a monsoon period of July-September. The Sonoran Desert supports a beautifully diverse flora and fauna that rivals most of the world’s deserts. Of the 594 taxa of plants on IFNM, 91 are “sunflowers” (family Asteraceae), 82 are grasses (Poaceae), 43 are cacti (Cactaceae), 36 are bean/pea relatives (Fabaceae), and 61 (about 10%) are exotic (i.e. introduced non-native species) but only six of these seem widespread and aggressive with Buffelgrass being the most problematic. The most ecologically important or keystone species include the ubiquitous Ironwood Tree, Paloverde (2 species), Saguaro Cactus, and Velvet Mesquite. Cacti include cholla (9 taxa plus 10 hybrids), prickly pear (7 plus 3 hybrids), hedgehog (3), pincushion (3), and barrel cactus (3). Ironwood is an abundant tree (to 30’ high) on the slopes and ravines of the mountains and is known to serve over 640 associated species of plants and animals for shade, food, perches and shelter. Like many other legumes its roots host nitrogen fixing bacteria that enrich the soils. Foothill or Yellow Paloverde and Saguaro or Giant Cacti are also important dominants of the slopes. Mesquite trees serve similarly important roles in the flatland deserts of the valleys often dominated by grasses and Creosote. Abundant bushes include Ocotillo, White Thorn and Catclaw Acacia, Triangle Bursage, Jojoba, White Ratany, Canyon Ragweed, Wolfberry, and Gray-thorn. Along the lower washes Blue Paloverde is common. Numerous and colorful annual flowers appear in early spring after good winter rains and in early fall. A number of unique species are mentioned in the areas described below. Insects are the most abundant types of animals, and ants are especially common, for example there are several kinds of harvester ants (feed primarily on seeds), leaf cutter ants (grow fungus gardens underground), and army ants (raid opportunistic food sources). Grasshoppers, beetles, cicadas, butterflies, and true bugs are common with each species being abundant according to its particular life cycle. Spiders and centipedes are common. More conspicuous animals such as vertebrates include 15 mammals, 55 birds, 43 reptiles, and 8 amphibians. Diurnal mammals (Black-tailed Jack Rabbit, Desert Cottontail, Harris’ Antelope Squirrel) are the most conspicuous but nocturnal or crepuscular species (Collared Peccary or Javelina, Kit & Gray Foxes, Bobcat, Mule Deer and Badger) are common. However, the most spectacular is the Bighorn Sheep. Once widespread in southern Arizona, these sheep reach their eastern-most AZ natural distribution in IFNM. Commonly observed birds include Gila Woodpecker, Roadrunner, Cactus Wren, Mourning Dove, Pyrrhuloxia, Gambel’s Quail, Red-tailed Hawk, and Turkey Vulture, but many other birds are easily recognized by experienced bird watchers. Reptiles include five species of rattlesnakes, Gila Monster, Desert Tortoise, and an assortment of lizards (Tiger Whiptail and Zebra-tailed lizard most frequently seen). The large Colorado River Toad may be seen during the monsoon season. A lone Organ Pipe cactus grows on the Ironwood Forest. It is one of three northern most individuals of this species, outside of their “normal” range. Photo BLM. This valley just west of the Santa Cruz River borders the eastern edge of the IFNM. Some valley agriculture occurs, but natural areas of IFNM are dominated by Velvet Mesquite trees and Creosote bushes. A total of 246 plant taxa are recorded in this Sonoran Desert scrubland. Blue Paloverde and large Velvet Mesquite trees with an occasional Desert Hackberry and Wolfberry are common along the major washes as well as a diversity of lush bushes. Prickly Pear Cacti and Burroweed may be common in overgrazed areas, with abundant spring flowers. This is a long range oriented south to north in the southern part of IFNM. Its main body extends south of the IFNM where its maximum altitude is 3,717’. A total of 327 taxa of plants are recorded and 21 taxa are unique in IFNM to this area. This is the only area in which an Organ Pipe Cactus occurs. Typically found west and south into Baja California, one large old OPC represents the second most easterly found plant of this species in the U.S. Some of the largest ironwood trees are found in these mountains. The “burnt bread mountains” are a small range near the southeastern border of IFNM east southeast of the Waterman Mountains. Two of the 276 plant taxa here are unique to IFNM. These complex mountains, with considerable limestone, lie south of the larger Silver Bells. A total of 312 plant taxa are recorded with 17 that are found in IFNM only here including Desert Agave, Yellow Trumpet-bush of tropical affinity, Canotia (one of three Arizona plants called Crucifixion Thorn that are more common below the Mogollon Rim), and Turk’s Head Cactus (Nicol’s variety here is on the endangered species list). The Elephant Tree (of Baja California and Sonora Mexico) reaches its eastern-most U.S. limit here. Only the eastern slopes of these largest mountains in the area are in IFNM. Its western slopes are outside the monument and heavily altered by the copper mining operation that started at the end of the 19th century. The highest elevation here is 4,195’. Plant taxa number 332 (56% of those in IFNM) with 7 plants unique in IFNM found only here. Until 1984 there was a permanent water stream in the Silver Bells but extensive mining killed the source which has no doubt affected both plant and animals distributions, especially frogs. The Arizona (Banana) Yucca is found as well in a rare vegetation association, a Jojoba plant chaparral, on the north slope of the Silver Bell Mountains. This iconic peak, at 3907’ and its smaller adjacent Wolcott Peak contain some of the most interesting plants and animals. There are 410 plant taxa (69% of the IFNM flora) including a few Shrub Live Oaks and a tropical plant of the four o’clock flower family, Pisonia capita, found nowhere else in the U.S. A herd of Desert Mountain Bighorn Sheep occur here and these range south into the Silver Bell and Waterman Mountains. The Chuckwalla and Desert Iguana reach their southeastern distributional limit here. The Desert Tortoise is common here and on several adjacent mountain slopes such as the Waterman, Silver Bell and West Silver Bell Mountains. The low hills north of Ragged Top have 252 plant taxa but only one unique species, an exotic weed. Ironwood, Saguaro, Foothill Paloverde, and many cholla species dominate the slopes as elsewhere in IFNM. These mountains west of the main Silver Bell Mountains are relatively low (2947’). They have 213 plant taxa but only one unique species, a grass. These mountains extend along the northwestern edge of the monument and are not easily accessible from Avra Valley roads. They are very dry (only 9” per year) with 323 taxa including 22 unique to IFNM. A distinctive sand-hills area and its associated biota occur near the northwest border of IFNM. This valley occurs to the west of the Sawtooth Mountains south to the Silver Bells. 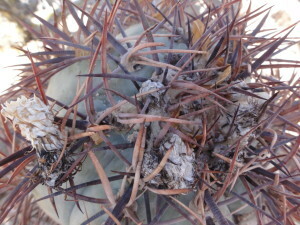 It has 165 taxa, including one unique species, a barrel cactus (Ferocactus emoryi). The Ironwood Forest National Monument has the densest stands of desert ironwoods anywhere in the world in part due to soil made up of Precambrian Oracle granite. This granite is characterized by large crystal size and it weathers into a coarse, very porous soil that allows deep infiltration of water and air. This porous, well-aerated soil permits tree roots to penetrate deeply to reach moisture. Soil explains much of the lushness of the tree growth in the Silver Bell region.